Since 2002, Prof. Nadia Magnenat-Thalmann of the Swiss National Center of Competence in Research Co-Me has been leading a project on interactive clinical visualization for hip joint examination. The goals of this research are to build a 3D patient-specific functional model of the hip joint, and to develop interactive tools allowing clinicians to examine hip behaviour. Such tools will be invaluable aids in diagnosis and treatment planning, particularly for osteoarthritis and impingement syndrome pathologies. While MIRALab is taking care of the modelling and clinical visualization, two Swiss partners "VRLab-EPFL and MEMcenter ISTB (University of Bern) " are responsible for scalable mechanical simulation methods. Medical consulting is ensured through extensive collaboration with radiologists and orthopaedists from the University Hospital of Geneva and Inselspital Orthopaedics - University Hospital of Bern. Prof. Nadia Magnenat-Thalmann is also project coordinator of the European Marie-Curie Research Training Network called 3D Anatomical Human. Having commenced in 2006, its objective is to train a body of researchers in the various domains involving the modelling/simulation of the human musculoskeletal system. 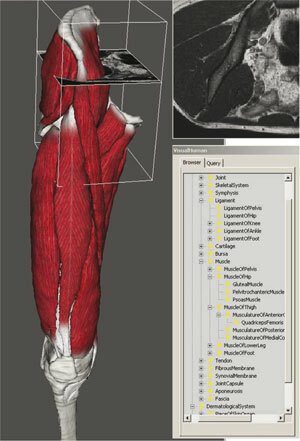 More explicitly, we aim at reducing the current fragmentation in musculoskeletal research by providing a bridge for partners from different domains of expertise: Medical Imaging (INRIA-Asclepios, University College London); Biomechanics (SMI-Aalborg University, LTM-Istituti Ortopedici Rizzoli); Computer Graphics & Animation (MIRALab, VRLab-EPFL, CRS4); and Knowledge Management (STARLab-Vrije Universiteit Brussel). MIRALab collaborates with two ERCIM partners (VRLab-EPFL and INRIA-Asclepios) in the domains of musculoskeletal modelling from Magnetic Resonance Imaging (MRI) and fast biomechanical simulation. Data acquisition modalities are becoming increasingly precise, available and standardized, as well as less and less invasive. In the course of their work, radiologists are required to analyse large amounts of data related to musculoskeletal anatomy, kinematics, dynamics, mechanics and physiology, and must therefore manage and visualize information at increasing levels of complexity. Individualized modelling of organs deals with shape, structure (fibre direction) and motion/deformation extraction from images. The specificity of the musculoskeletal system is complex due to the relatively large spatial scale and the large number of interrelated organs. Regarding the musculoskeletal simulation aspect, researchers face geometrical, mechanical, chemical and physiological complexity: a variety of events can occur at very different spatial scales (eg micro versus macro mechanical interactions) and temporal scales (eg muscle actuation versus muscle longitudinal changes). Consequently, the study of musculoskeletal functioning has been compartmentalized into various disciplines, though these are not independent, resulting in partial and oversimplified models (eg precise mechanical models of a single tissue, complete limb model using simplified muscle action lines and simplified skeletons etc). A higher and unified level of simulation (co-simulation level) taking into account large scales (eg anatomy-based virtual humans animated from motion capture and electromyography) as well as small scales (eg deformations due to local fibre actuation) is not yet available. This would be of major benefit in linking the different disciplines, and would allow a better understanding and a more accurate simulation of the musculoskeletal system. This in turn would lead to new applications in the field (eg post-surgical predictions, functional prosthesis). To bridge modelling and simulation levels requires on the one hand fast and well-constrained (mostly geometric and surface-based) segmentation methods and on the other hand, accurate predictive methods (physical and volumetric models). To guarantee the efficiency and the accuracy of segmentation methods, these latter are taken into account in the clinical protocol that drives MRI data acquisition. Within particle-system frameworks we propose geometric/ physically-based techniques to reconstruct and parameterize mechanical models from image data. Passive characterization of tissue through mechanical testing is carried out and incorporated in the model, along with motion capture, electromyography (EMG) and force-plate data. Since mechanical models manage volumetric meshes, equivalences between surface and volumetric meshes are studied through intermediate medial representations. The multi-organ and multi-tissue nature of the problem involves a fast handling of collisions/contacts, and multi-resolution meshes are required to allow a scalable control of the complexity. Moreover, in order to meet timing constraints during interactive tasks, new rendering techniques have been developed. Finally, to fuse multimodal data, to combine redundant information (eg MRI-based models and motion, and motion-capture data), and to insure completion of sparse data, we use a high-level representation (medical ontology). This also permits medically relevant data management (eg visualization tools for clinicians) and analysis (eg subject comparison and statistical analysis).